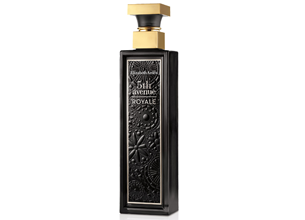 Intense but elegant, 5th avenue ROYALE Eau de Parfum Spray is the alluring accessory to your night on the town. This oriental mosaic fragrance exudes regal elegance for the woman who is riveted by New York City nights. The shiny, jet black bottle exudes mysterious elegance, complete with front embossing and a gold smoke-effect cap which is inspired by New York City’s art deco architecture.